Wolfe’s Neck Woods State Park is a gorgeous coastal hike. It’s my favorite type of trail. After hiking through the forest, you take a short passage down to the ocean’s edge and emerge onto stunning coastal views. We did this hike as winter was winding down last year, so the snow was manageable as we hiked through the forest, although we did still need our crampons. When the weather starts warming up, you need to be extra cautious about ice. Since there is a lot of melting and refreezing happening at this time of year, there can be some hidden slick spots. The entire hike was wonderful, but the best part was easily the spectacular ice patterns that had formed over the rocks that are scattered on the beach. With the sun glistening off the ice, it was otherwordly and we had a lot of fun exploring along the water’s edge. Do you live next to the ocean? Do you have a favorite spot to go? 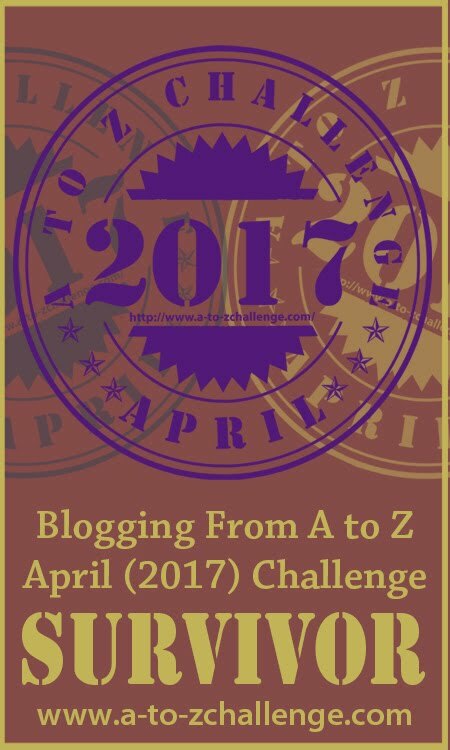 So glad to see you are still participating in the A to Z! Great photos and places, as usual. Thank you! I wasn’t sure I was going to do it again this year but I decided at the last minute. I really enjoy the chance to interact with other bloggers during the challenge. We do have some areas that are more traditional sand beaches but even those often have some rocky outcroppings close by. I’d love to get to Australia someday and see the beaches. We are so far inland. It takes at least 16 hours to drive to the Texas Gulf Coast. Enjoyed these scenes! I can’t imagine being that far away from an ocean although I’m sure there are other beautiful destinations close to where you live. I live near the beach but it never has snow on it. Although I grew up in the country I couldn’t bear to move away from the sea now. If anything I would like to move closer as it is forty minutes walk to get there. Unfirtunately that walk is through suburbia, not beautiful forest. There are some great walks nearby in the Royal National Park, however. I love your photos. Beaches don’t keep the snow for long with the wind and sun, but every now and then you can catch them at just the right time. That’s great that you have some good walking spots close by. We tend to explore for our hikes but there are a few close too. Sandy beaches are nice too! Looking glorious in those pictures! Thank you. Our coastline is quite photogenic. I love the rare opportunities I have to be near water. I live in the Sonoran Desert in Southern Arizona. The images of last vestiges of winter ice are striking. I love being near the ocean although there are some amazing things to see in the desert too. Beautiful pictures, looks like a place I would love to hike! Thank you for sharing this! I don’t live anywhere near the ocean… but I wish I did! It really was a gorgeous hike. The ice was so interesting on the rocks. My favorite photos are the icy rocks as well! They are all lovely photos! Would love to visit Maine sometime, perhaps the closest I will come is via your blog My family loves the beach, but we usually go south for sandy ones. We shall see! Sandy beaches are great too although I am partial to the rocky coastline. I hope you make it to Maine someday. We’ve been camping at Wolfe’s Neck Farm nearby a few times and after trying someplace else last summer, the kids want to go back to Wolfe’s Neck Farm this year. We haven’t been to the State Park so I’m going to have add that to the “to do” list, although the scenery is very similar at the campground. Yes, the Wolfe’s Neck Farm camping area is beautiful. It’s a gorgeous spot! I think I’ve fallen more this time of year than any other – I really need to pay better attention to ice and slick spots! It really is treacherous this time of year. You have to be careful. This morning was a very unpleasant drive in – the first third of the drive was an ice slick. On the plus side, I made it into the office without (a) driving off the road, or (b) biting it on the walk into the office. I hate drives like that. They’re so stressful. Yes, hurricanes are the down side of ocean living although we usually don’t get them as bad as in the south. Lovely theme and lovely pictures! Thank you. It was a really lovely spot. I don’t live anywhere near an ocean. I mean, I live in a prehistoric ocean, but that doesn’t count. I love your pictures and super jealous you are so close to that. I’m spoiled having lived my entire life super close to the ocean. There are a lot of great places to visit in the US. Of course, I’m partial to Maine. Wow! Just wow! We lived at the beach in So Cal for a year, but it’s just sand. This is WOW! I do love a rocky coastline although I bet the the beaches in So Cal are pretty nice. Oh my goodness, this place looks beautiful!!!! It really is an incredible spot. I’m looking forward to hiking it again.